The Crop Circle Connector team chase the formations across the southern English landscape to bring you breathtaking imagery from the air and the ground providing a comprehensive coverage of the highlights that shaped the 2004 season. Every year remarkable formations appear in the ripening crops all over this beautiful landscape. The Team set out each season to capture many of the key formations onto digital video so as they can be preserved and enjoyed on DVD forever. The combination of aerial and pole photography completes a comprehensive coverage of each formation as we travel between each site. 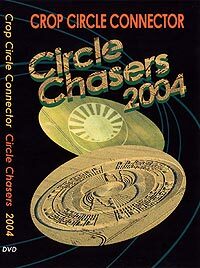 The Crop Circle Connector has encapsulated the beauty and power of these formations in the landscape, and is the perfect companion to the web site, as we celebrate and enjoy 'CIRCLE CHASERS 2004'. Duration 48 minutes. The 2001 Season 29 minute video, with narration, including the Milk Hill 409 circles event. Shown in Barcelona, Spain, March 2002. Plus amazing Pewsey Vale UFO events, which occurred on 22nd July 2004. A key interview with the two Norwegians who witnessed these extraordinary occurrences.